This is an agreement between a contractor and a business owner providing limitations on the extent to which the contractor may solicit the employer's clients or customers. It will be most useful to businesses where the contractor or employee has regular contact with clients or customers as well as confidential information about your business. 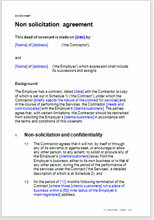 You can either cut and paste the contents of this document into your ‘about to be signed’ contract, or, if you already have a contract or services agreement, use this document as an amendment and simply attach your original contract to the back of this document. This non-solicitation agreement provides that the contractor may not solicit in any regard - the Contractor must provide services to the Employer only. After the contract ends, the restraint is simply limited in time and geographical extent. You choose whether you want an absolute restraint, or a restraint only within a geographical area such as Eastern Cape, or North West. Additionally, you can limit the solicitation to time – for example, for six months, or two years, as you prefer. Of course, you must be reasonable – if the contractor were to challenge this document for any reason, the less strict the restraints the more likely it is that a Court would uphold them as reasonable. It would clearly be unreasonable, for example, to forbid the contractor to ever provide services again after the end of your agreement. Real law in plain English. Other usual legal provisions to protect your interests.